The archivists behind three of the biggest liquor brands share what it takes to keep the history of their drinks alive. From an advertisement for Bacardi rum and Hatuey beer, circa 1949. Photo courtesy of Bacardi. Though the word "archivist" may conjure images of dusty stacks of books and crumbling scrolls, the reality of the job is one of discovery, surprise, and collaboration. In the world of major liquor brands, a specific company's history may go back hundreds of years, and the history of the business can be traced to match the history of the times and tastes around it. Along with working to inform current marketing trends, a brand archivist is also the preserver of the history and legacy of a company, and in the world of liquor advertisement there's plenty to save and savor. The Whisky of His Forefathers advertisement by Matthew B. Hewerdine, 1894, shows a whisky so good as to entice ancestral spirits out of a painting frame. Photo courtesy of Dewar's. "Some archives can be quite academic and paper-based," says Jacqui Seargeant, the Global Archive Manager for Dewar's Scotch Whisky. "But ours is very diverse. We have the old documents and the old advertisements, but we also have old bottles, old water jugs and promotional materials. Our archivists are involved with meeting the marketing team to come up with new ideas for marketing and packaging. It's a really unusual job in a lot of ways." Advertising poster of Martini & Rossi, printed by Doyen Lithograph in Turin, 1895. Photo courtesy Martini & Rossi. So, what does it take to be a brand archivist? "You have to like the details. All the research is quite meticulous," Seargeant explains. Poster of a Martini Jockey by the artist Jean Droit, circa 1948 in France. Photo courtesy Martini & Rossi. "We have three keywords: to inform, to inspire, and to engage," says Anna Scudellari, the Brand Heritage and Archive Specialist for Martini & Rossi. 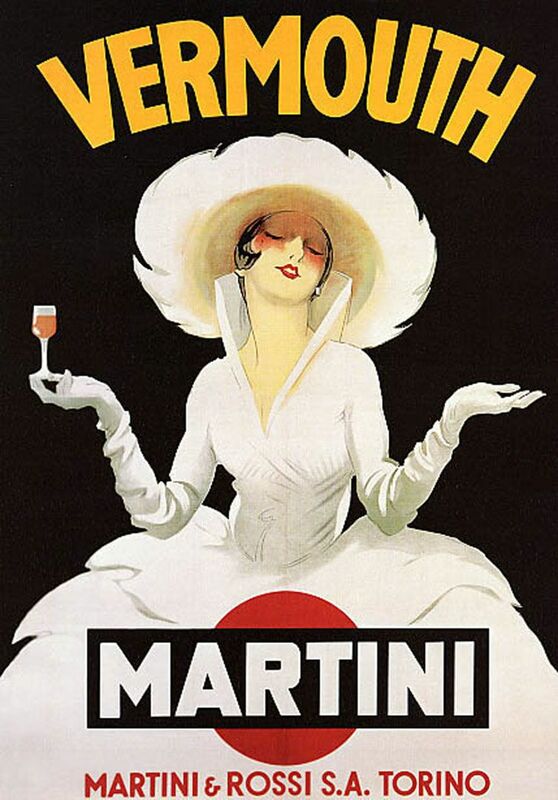 Martini & Rossi have always been known for their iconic advertisements, like the famous woman in the white hat. As she works through the archives, Scudellari's amazed at the amount of history still stashed away, waiting to be unearthed. "Imagine books and folders creating a long line, one beside the other. This line is 700 meters long. So there are a lot of possible discoveries." One such discovery, made a few years back, may have included one of the earliest liquor advertisements ever committed to film. "We were working on the celebration of the 150 year anniversary of the brand," Scudellari tells Creators, "and we found a rusty old box containing an old film that needed a restoration. It was quite well-preserved, and it revealed a movie from the beginning of the 20th century, 1910s or 20s and it shows the Martini production process. And the most beautiful scene of the film is a scene in a bar where a gentleman and a lady are elegantly dressed and sitting drinking a Martini and Soda, and the couple toasts with enthusiasm, and at a certain point the lady notices the watching camera, so she toasts and salutes the audience. I think it is the first video advertising of the Martini story." This poster dates back to the early 1960s, when Bacardi's Cuban assets were seized by the government. Photo courtesy Bacardi. When Juan Bergaz Pessino, a sixth-generation Bacardi family member and archivist for Bacardi Rum, first joined the archive team, he "was very surprised at the amount of assets and artifacts that we have, especially because we lost everything in Cuba." Castro's regime confiscated Bacardi's assets in 1960. Pessino explains that the story of Bacardi is intricately tied to the story of its country of origin: "When you go into the archive you can see the whole history of Cuba, and some of the history that you won't find elsewhere because Castro changed the history. We even have a newspaper from when the company was confiscated." A Bacardi advertisement from before the revolution, dating all the way back to 1927. Photo courtesy Bacardi. For more information and images from the history of these liquor brands, check out the individual hubs for Dewar's, Bacardi, and Martini & Rossi.